Technology in the Robla School District classroom has come a long way in the 16 years I've worked for the district. When I started, if a classroom had one computer, they were doing well. During the first summer I worked here, we received 162 desktop computers. Those computers allowed us to put a computer into every classroom. Now we sit at around 500 staff computers, 2,000 Google Chromebooks, 600 student and staff iPads, and countless network devices. To say the Technology Department has been busy is an understatement! For the 2018-19 school year, the Technology Department is continuing to expand. Recently relocated into the district office complex, our new office space allows for a proper work bench and support center for the teachers and staff of the Robla School District. In addition, the Technology Department launched School Dude this past summer to better track issues and communicate with staff and so far it has been a huge success! Over the 2018 summer, the district transferred it's mail platform to Google. Now fully integrated as a Google Apps for Education (GAFE) district, the district is pushing forward with training and streamlining a number of programs to make accessing them easier, especially for students! Working with Clever, the Technology Department has integrated a number of programs such as Renaissance Place, Lexia, and a host of other programs that students can access from one location. Students can quickly switch between tasks and only need to remember one username and password, or for our younger students, simply log in with a QR code. With the ever increasing demands of technology, the Technology Department works closely with the Technology Enrichment Teachers to ensure students receive a well rounded education in technology on a variety of platforms, from Google Chromebooks and VR Goggles, to RC racers and Apple ipads. Students also receive classes on digital citizenship, typing, and word processing, while incorporating English, math, and science standards to meet goals set within the California Common Core. We have a slogan in the Technology Department, often referred to as District Office Information Technology (Do It), when it comes to technology, we can do it! Our dedicated staff offer a wide range of abilities and talents and allow us to meet the challenges of ever-evolving technology curriculum, security and safety concerns, and new technology. 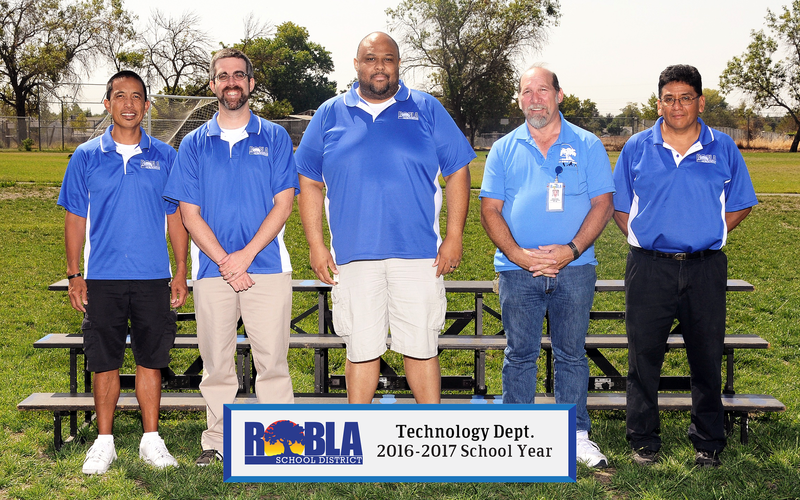 Simply put, the Robla Technology Department is up to meet the needs of students, staff, and families well into the 21st Century and beyond.